You can’t beat a good book, but some of us may find the opportunity to read books dwindling. The present age offers different entertainment experiences – we can store all of our books on one kindle device rather than keeping shelves of them, and for those of us that used to follow magazines, the internet is rife with blogs that fit the niches we are interested in. On the other hand there are temptations from second hand shops and online sellers to sweep up lots of great book bargains that will certainly not go away any time soon. We are raised to treat books with respect, and parting with them is often rather difficult. Hence when it comes to a big house move, the topic of all the books that have accumulated comes up, and if there is one type of item that is bound to be left behind in self storage post-moving, it is likely to be excess books. The problem with books is that paper material can easily degrade if storage conditions are not favourable. Storing a collection of magazines in a box and putting in the far reach of a spare room, or in a basement etc., going back a year later you might be surprised at the general mustiness that has built up from retained air moisture and cycling temperatures. If you are serious about storing books for a long period of time for use or sale later on, you ought to look into self storage possibilities near you as the answer and see if you can arrange a climate controlled solution that will offer premium conditions to store your books and magazines all year round. Two problems that often occur when storing these items are pages yellowing, especially for magazines where the paper may deliberately offer less permanence, and pages or covers sticking together. These problems can devalue books slightly, and stuck pages can lead to damage when attempting to separate them. The solution is to store books in a way that discourages these chemical reactions from occurring, or at least minimising the likelihood. You need to ensure that the type of material your storage boxes are made of does not contain chemicals that will in the long run react with paper – it is worth having this conversation with the supplier or manufacturer. 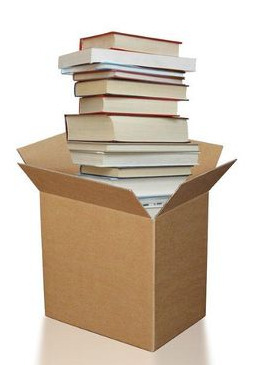 And whilst in the rush of a move you may only have time to heave piles off books off shelves and into boxes, consider for long term storage that you will need to find a way of keeping books separate using tissue, card or other materials verified specialised for this purpose, if their value is going to be kept retained. Bear in mind in addition that books en masse tend to be rather heavy. As such boxes containing books need to be tightly sealed and reinforced so that they don’t put too much of a load onto the box itself. Don’t overpack boxes so that they are either in risk of the bottom giving way, or so that they are a health and safety hazard to lift or rearrange. Better to invest in a couple more boxes than to run into either of these problems. « Any advice for storing monitors or TV screens?